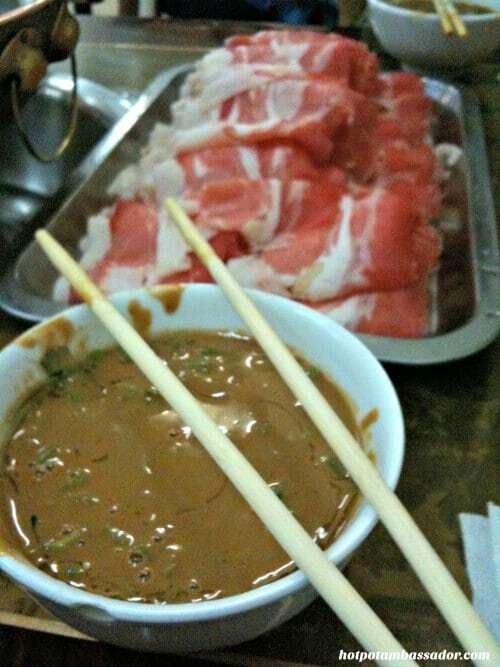 The dipping sauce is an integral part of the hotpot experience, and many tasty ones can be bought ready-made. Some recommendations. Like bread and butter, lemon and tea, popcorn and salt, the right dipping sauce is a hotpot’s best companion. 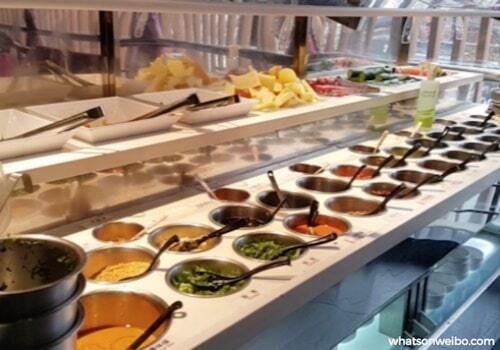 If you have ever been at a Chinese hotpot restaurant such as Haidilao you might have seen the sauce bar: a great collection of different ingredients and condiments, from soy sauce to sesame oil, from chili powder to cilantro, from garlic to vinegar. How to choose what to put in your sauce bowl?! The right answer is: there are no rules. You can do whatever you like. 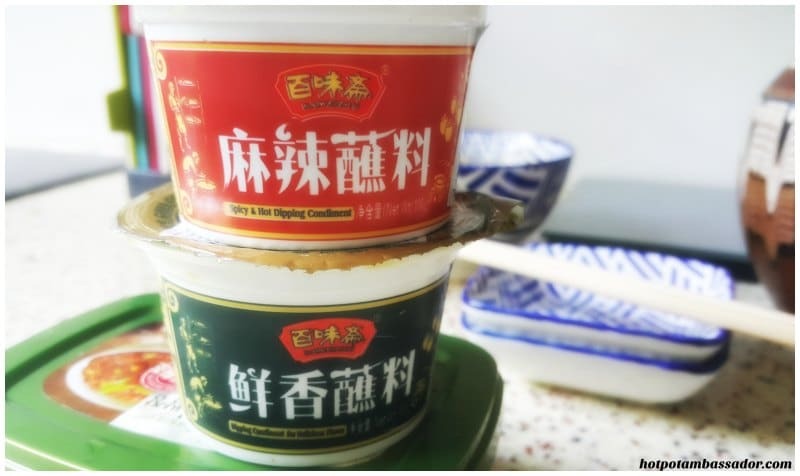 There are, however, some common combinations of dipping sauces in China that many people love, but there is one big difference in what is preferred in the south of China and what is preferred in the northern parts of China, and the keyword is sesame paste. Typical ‘zhimajiang’ in a local Beijing hotpot place. 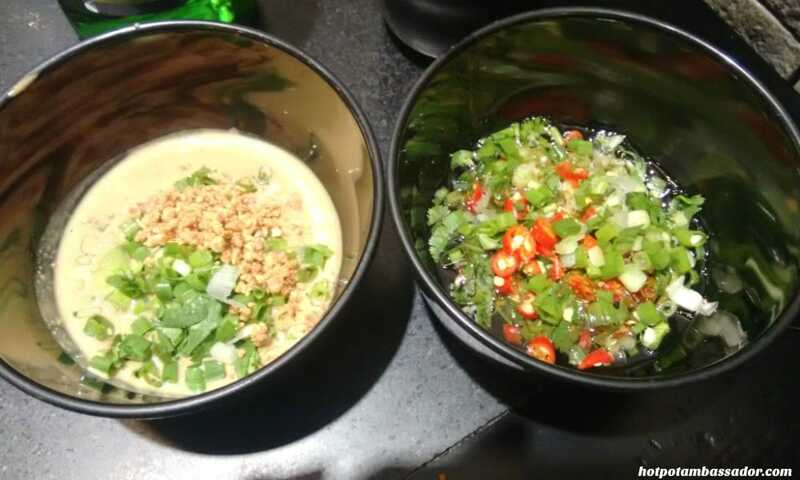 There is not necessarily a special reason for this difference in dipping sauce preference but simple longstanding regional customs and traditions; people in the North also often like noodles, for example, whereas rice is preferred in the South. 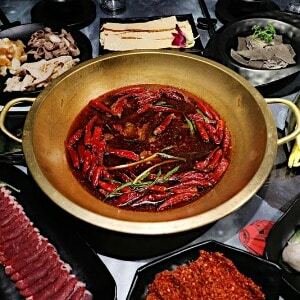 Sesame paste or Zhīmajiàng (芝麻酱) is a dipping sauce that any respectable hotpot restaurant in Beijing will definitely have. In southern cities, however, it is not common at all. 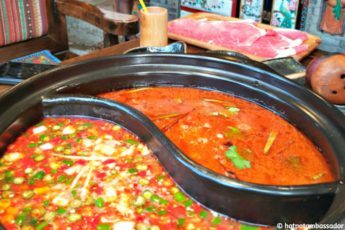 The reason so many people love to have sesame sauce with their hotpot, is that it balances out the salty and spicy hotpot broth with its mild and sweet flavor. 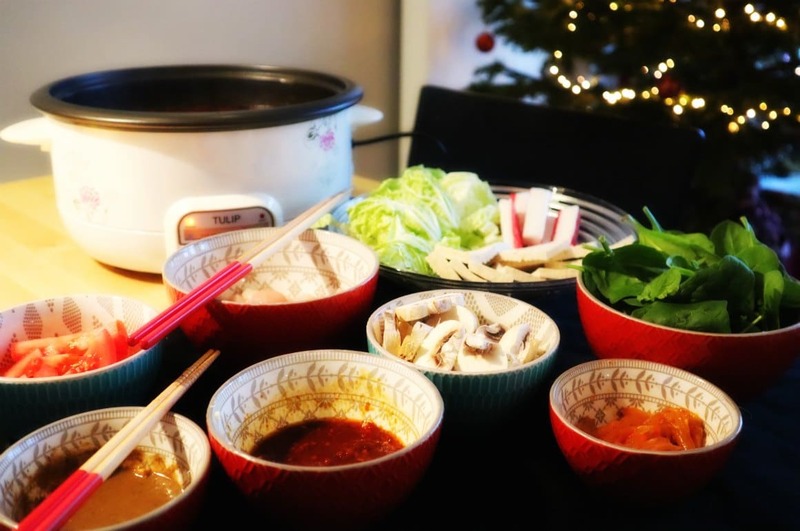 It also suits many different styles of hotpot. You can make the popular sesame sauce yourself. However, it does require some skill and all the right ingredients, as it requires you to properly mix ingredients such as pure sesame paste, peanut butter or satay, pickled tofu, leek flower sauce, oyster sauce, sesame oil, and water or broth (we will put up a proper recipe for this later). 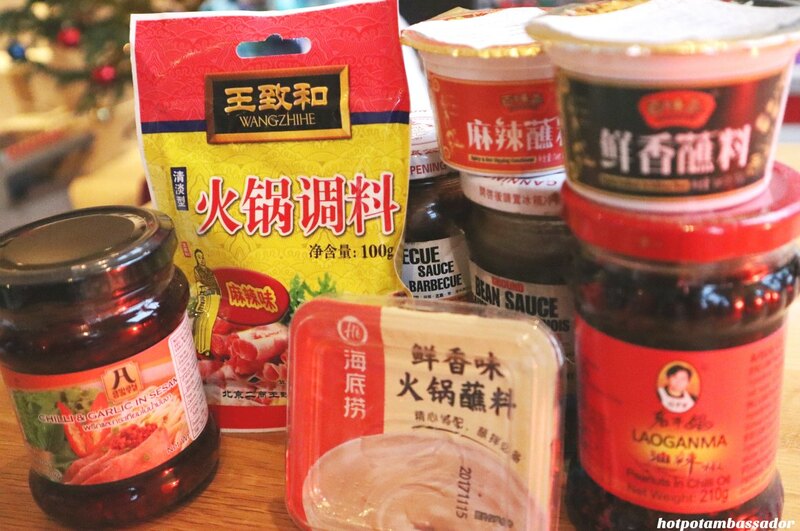 Besides the sesame sauce, there are also other sauces that are popular all across China. Think of a combination of crushed chili + dark soy sauce + vinegar + coriander, for example, or a sauce where sesame oil + scallions + garlic + chili oil + vinegar are mixed, or a blend of oyster sauce + sesame oil + soy + garlic + scallions + sesame seed. Or what about Worcester sauce + sesame oil + crushed peanuts + BBQ sauce? As long as you have some of the basic ingredients at home, you can pretty do anything you like. A quick and easy one simply mixes soy sauce with a bit of sesame oil and some chili oil or chili flakes. But if you don’t feel like mixing everything together in your own kitchen, there are plenty of nice dipping sauces that are ready-made and can be purchased that way. It is recommended, however, that you do have some sesame oil, soy sauce, fresh garlic, and cilantro in your kitchen to add to these sauces to make them less strong and tastier. An ingredient that is not common in (northern) China, but which I personally love to mix with sauces, is lemon juice instead of vinegar, as it can add a bit of sour and sweetness, giving the sauce that special fresh taste. 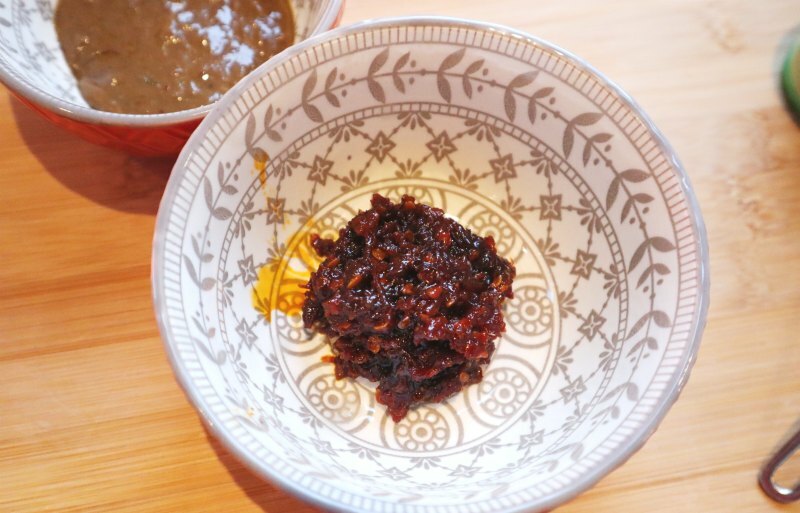 One way to make your perfect dipping sauce at home is to get a ready-made chili & garlic sauce, and to mix it to taste with some sesame oil and soy, depending on how strong it is. There are various brands out there, but the Lee Kum Kee brand has a nice Chilli Garlic Sauce that you could mix whatever way you like it (remember my personal recommendation for adding a hint of lemon juice!). Add some chopped fresh cilantro and garlic to make it tastier. There is also one sauce called the Asian Gate Chilli & Garlic in Sesame Oil from Thailand which I personally use a lot (but which is not sold everywhere), but you can surely find many different variations of chili & garlic sauce in your local (Asian) supermarket. Just add just sesame oil, fresh garlic, coriander, lemon juice or vinegar, and maybe some scallions. What I do: a spoonful of chili-garlic sauce, and then add some sesame oil and lemon juice. This is after mixing the sauce up a bit. 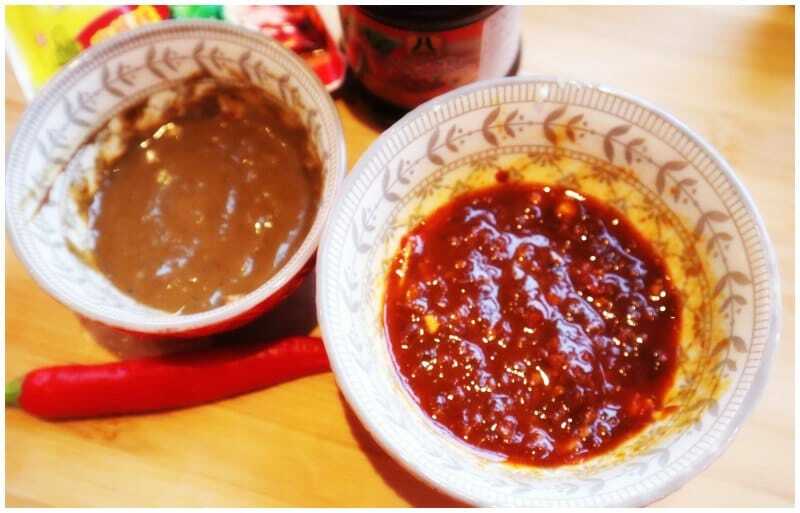 I always like to have a sesame-based sauce (left) and chili-oil based sauce (right) together. 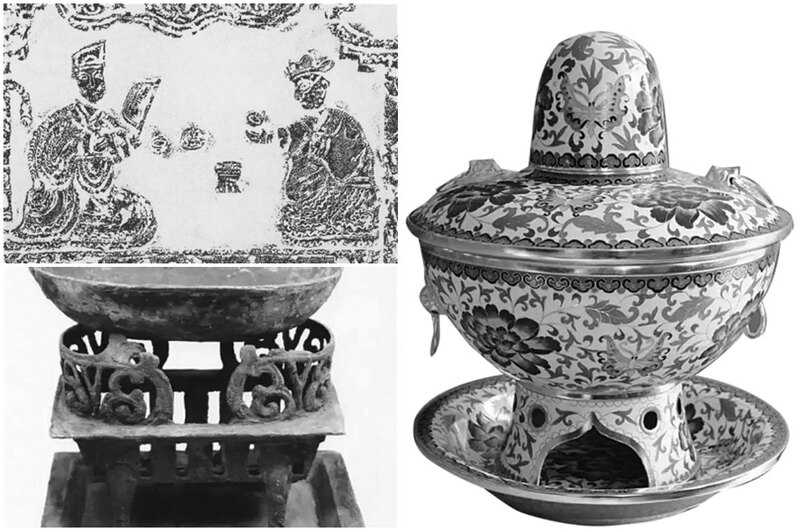 The story of the Laoganma brand is actually also an intriguing one, as a woman called Tao Huabi (陶华碧), whose portrait is on the packaging, created China’s most famous chili sauce while she was living in poverty and then became a multi-billionaire (check out her story here). 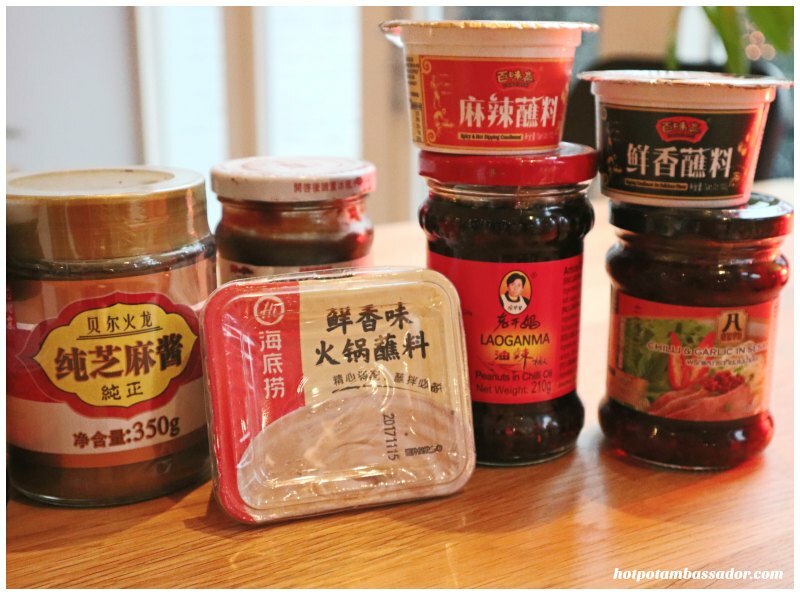 Besides chili, the Laoganma sauce contains soybean oil, Sichuan pepper corn, and peanut (depending on what flavor you pick). Stir it up with some soy sauce and sesame oil to make it less strong and to get that nice dipping sauce texture. There are some sesame sauces available that are ready-made and don’t require much work. 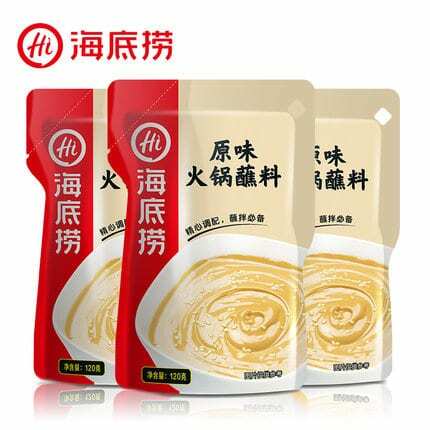 My favorites are those by the Haidilao brand and the Wangzhihe brand. This last brand also sells the pure sesame paste but also has packages that are good the way they are. The only problem is: they are not that easy to find in your local (Asian) supermarket. If you’re in China, it should be no problem, but outside of China, you might only find them in the biggest Chinatown supermarkets (I found some in London, for example). 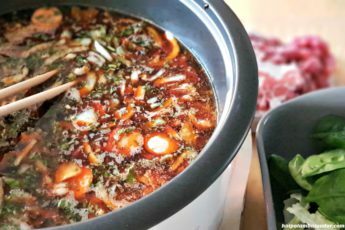 You might still like to add some sesame oil to these sauces to make them smoother and less strong, or just start dipping away and the broth from the hotpot will make them tastier throughout the hotpot dinner. If you want to try something different, you could also try out the Japanese style shabu shabu sesame sauces, such as the one by Mizkan. 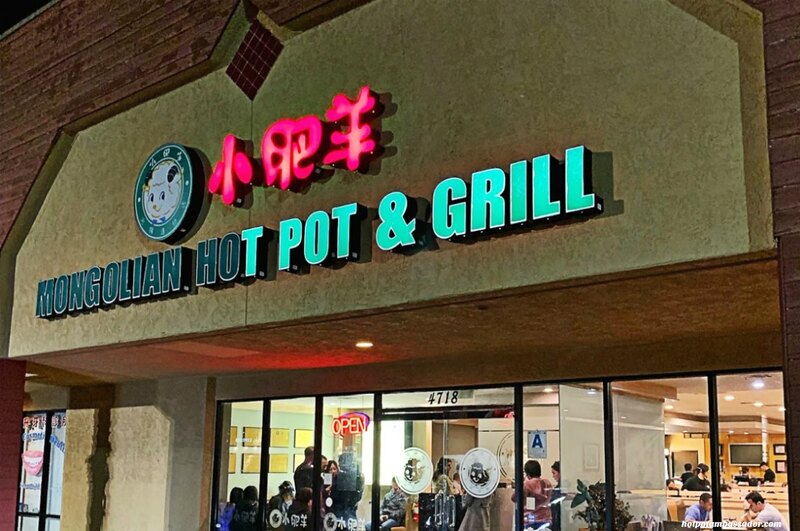 There are also multiple condiments available that have a bit of everything; the sesame, the chili, the garlic, the soybean oil, some sichuan peppers, etc. 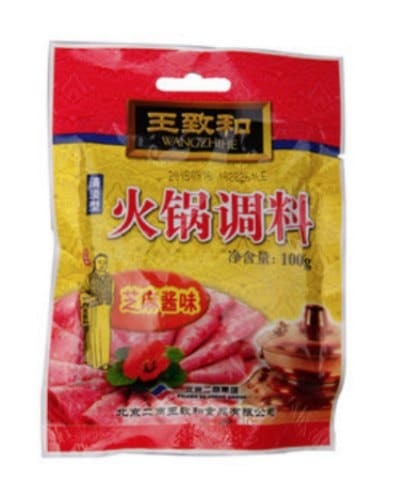 One example is by the brand of Baiweizhai (百味斋) that has a spicy version (red) and a regular version. Even with these kinds of ready-made condiments, I still like to stir them up with some extra sesame oil to make them smoother and less salty, but that is up to personal taste. 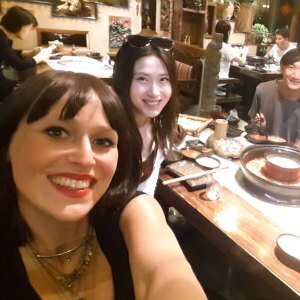 These sauces (or those similar) are probably sold at your local Asian supermarket, but JD.com also sells them online. What’s your favorite dipping sauce? Let us know in the comments below. 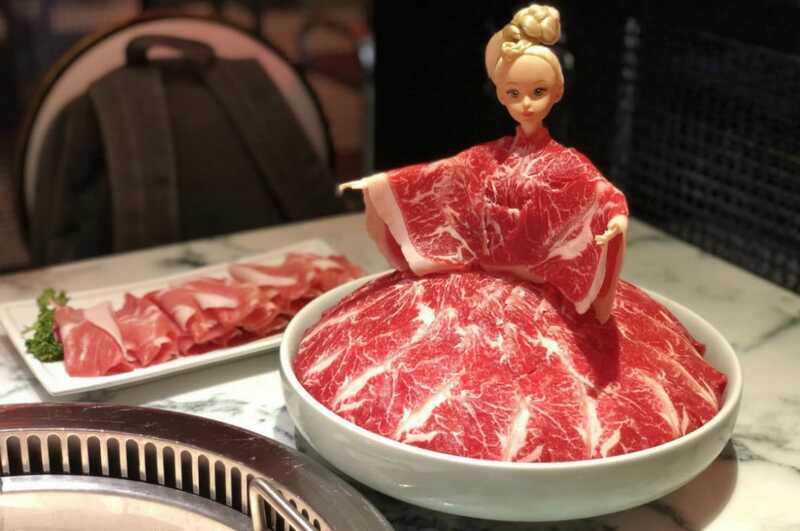 ©2019 Hotpot Ambassador. All rights reserved. Do not reproduce our content without permission – you can contact us at info@hotpotambassador.com. Sesame + dark soy + cilantro + garlic! !